This is the first beer I've ever had that tasted exactly like a Jamaican style ginger beer. 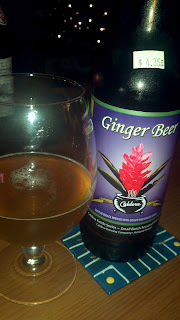 You know the variety that burns your nose with the intense ginger flavor, sort of like chewing on the root of a live plant? I can only speculate about how awesome this would be with some lime and carribean rum, but even on it's own I was quite happy with it. What the hell does "origin: east" mean?